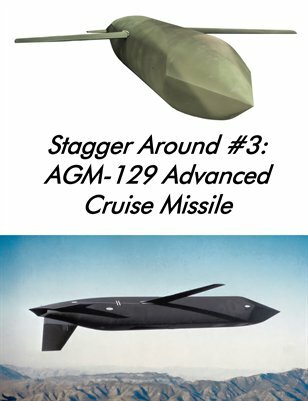 Stagger Around #3: AGM-129 Advanced Cruise Missile. This photo essay shows several examples of the stealthy cruise missile once employed by the USAF. Includes the example at Hill Aerospace Museum, Utah; National Museum of the United States Air Force in Dayton, Ohio; Strategic Air and Space Museum in Ashland, Nebraska; the San Diego Aerospace Museum restoration facility in El Cajon, California. Also includes 1/32 scale diagrams of the AGM-129, official photos showing the AGM-129 deployed by a B-52H and a rare General Dynamics AGM-129 display model.